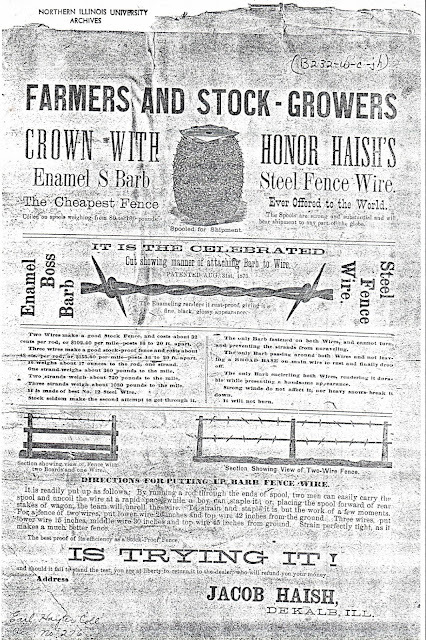 A Twist in History: "Two Wires Make a Good Stock Fence"
"Two Wires Make a Good Stock Fence"
The below advertisement, courtesy of Northern Illinois University Archives, boasts Jacob Haish's "S" barb steel wire as "the cheapest fence ever offered to the world." The advertisement provides a thorough description of Haish's creation. 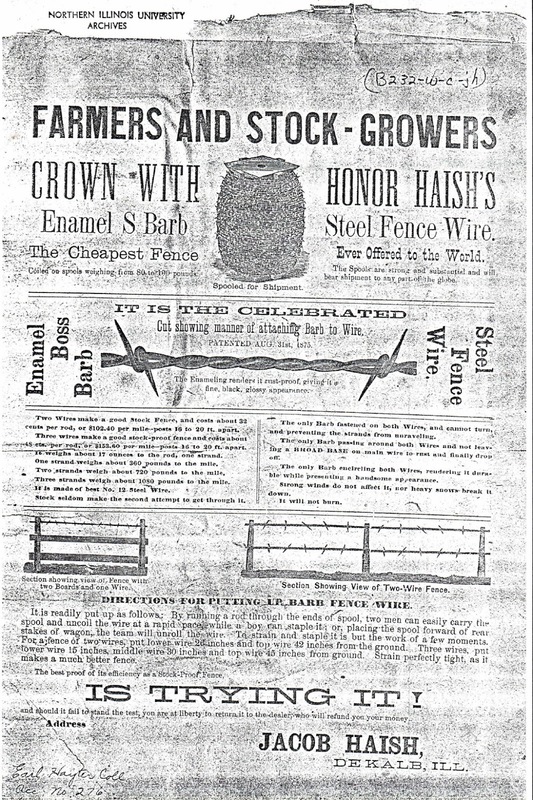 CROWN WITH HONOR HAISH'S ENAMEL S BARB STEEL FENCE WIRE. The Cheapest Fence Ever Offered to the World. Coiled on spools weighing from 80 to 100 pounds. The spools are strong and substantial and will bear shipment to any part of the globe. It is the celebrated cut showing manner of attaching Barb to Wire. The enameling renders it rust-proof, giving it a fine, black, glossy appearance. Two Wires make a good Stock Fence, and costs about 32 cents per rod, or $102.40 per mile-posts 16 to 20 ft. apart. Three wires make a good stock-proof fence and costs about 48 cents per rod, or $153.60 per mile-posts 16 to 20 ft. apart. It weighs about 17 ounces to the rod, one strand. One strand weighs about 360 pounds to the mile. Two strands weigh about 720 pounds to the mile. Three strands weight about 1080 pounds to the mile. It is made of best No. 12 Steel Wire. Stock seldom make the second attempt to get through it. The only Barb fastened on both wires, and cannot turn, and preventing the strands from unraveling. The only Barb passing around both Wires and not leaving a BROAD BASE on main wire to rust and finally drop off. The only Barb encircling both Wires, rendering it durable while presenting a handsome appearance. Strong winds do not affect it, nor heavy snows break it down. It will not burn. DIRECTIONS FOR PUTTING UP BARB FENCE WIRE. It is readily put up as follows: By running a rod through the ends of spool, two men can easily carry the spool and uncoil the wire at a rapid pace, while a boy can staple it; or, placing the spool forward of rear stakes of wagon, the team will unroll the wire. To strain and staple it is but the work of a few moments. For a fence of two wires, put lower wire 26 inches and top wire 42 inches from the ground. Three wires, put lower wire 15 inches, middle wire 30 inches and top wire 45 inches from ground. Strain perfectly tight, as it makes a much better fence. The best proof of its efficiency as a Stock-Proof Fence, IS TRYING IT! And should it fail to stand the test, you are at liberty to return it to the dealer who will refund you your money. Image courtesy of Regional History Center, Northern Illinois University.